Cdr, Authorised Version ‎– AV037, 2011, Ltd 100, four panel cardboard sleeve. 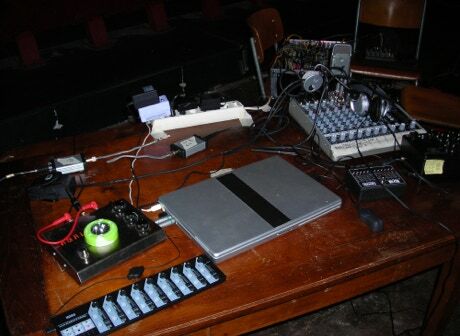 A live collaborative session recording from Francisco Meirino (computer, magnetic field detectors) and Jason Kahn (analog synthesizer, shortwave radio) recorded in the empty cinema Oblo in Lausanne, Switzerland in 2009. Really tired tonight, but glad that week is over and I have a couple of days off now. 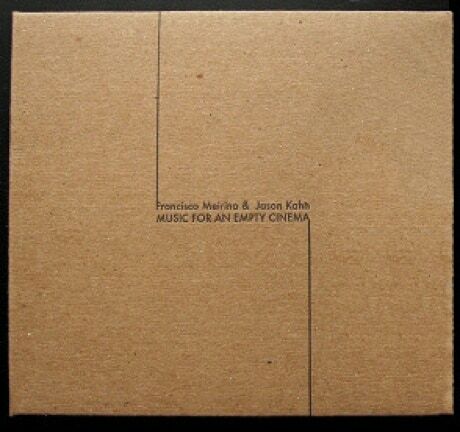 I haven’t been home much for a couple of days, and arrived back here quite late tonight, so have been listening quite intently since getting in to a new CD release on Phil Julian’s Authorised Version label, a disc named Music for an Empty Cinema by the duo of Francisco Meirino and Jason Kahn. Meirino is a name that I didn’t know, but a bit of simple googling reveals that he released many CDs over a decade or so until 2009 using the name Phroq. I don’t remember exactly where, but somewhere amongst my library I have a CD containing something credited to Phroq, though what and where it is I can’t remember. Now using his far more appealing real name, Meirino works on this track with laptop and magnetic field detectors, alongside Jason Kahn’s very familiar analogue synth and shortwave radio. The album was apparently initially recorded live at a cinema in Switzerland in 2009, with the material then edited a year later. Whether the concert was a closed door affair, or whether just few people arrived I am not sure, but the album’s title suggests not too many people were in attendance, which is a shame as the music is rather nice. In many ways this CD is archetypal Jason Kahn. Across the disc’s song thirty-eight minute long track we hear clouds of hissing, fizzing, crackling, ribbiting distortion as we have many times on his releases. Meirino seems to work with sounds very much along similar lines, to the point that I couldn’t really tell which of the pair make which sounds here, even if it were possible to separate them into two distinct sets, which it really isn’t. The nearest comparison here is Kahn’s work with Asher- a hazy, smudged wall of what sounds at first like white noise, but in fact is made up of much bigger particles, just many of them, constantly shifting, with new elements continually appearing, but the overall impact remaining as one long sheet of sound, like sitting in a room surrounded by twenty or so detuned shortwave radios, which of course isn’t all that far away from the truth here. The difficulty with this album, as with other albums I have heard from Kahn before, is in working how to react to it. On the surface I wonder what emotions music like this could possibly give off, what it might express, but listening closely, losing yourself in the fields of sound, while maybe not singing out with one particular set of sentiments or anything so simplistic, is a deeply immersive, almost overwhelming experience. Turning the music up quite loud, trying to imagine how it must have been heard in the cinema space places you in the middle of a tiny, controlled maelstrom as things fly around your head, buzzing about, seemingly misfiring and malfunctioning. It shard to think about much else while you listen, difficult to make notes, do much else than fend of the music as if it were a cloud of flies about your head. What isn’t clear to me is to what extent did the post-production editing change what was played live into what we hear on disc. Certainly it all sounds quite fluid and uncomposed, but then music of this kind would probably sound that way no matter what. Ultimately it doesn’t matter anyway, and this is a fine piece of work that will appeal to those into the more laminal, electronically altered end of improvisation as well as perhaps a number of people crossing over from the more creative end of the noise scene. The disc also comes wrapped in a card sleeve embossed by the good people at Middle Press, which immediately makes it a more desirable object as well.